EDWARD HEELIS. The Kildwick registers do not go back far enough for us to find the baptisms of this couple. We should expect their birth dates to be around 1560, in the early years of Elizabeth I’s reign. Edward not only married in Kildwick but brought up his family there. It is likely that he was living there at the time of his marriage. There is, however, no evidence of a large extended family. This would indicate that the Heelis family had not been in the parish for long. There is burial in Kildwick on 2 Nov 1581 of Robertus Helesse 70ta annora (70 years old). It was unusual for ages at death to be given at this time. No doubt 70 was considered a remarkable age and worthy of mention. Given the small number of Heelises in Kildwick it is reasonable to assume that Robert was related to Edward.. He is probably his grandfather. There is another burial on 3 Dec 1597 of “Maria Heelesee Silsden More”. No relationship is given. She could be Robert’s widow and Edward’s grandmother or his mother. Kildwick was a small parish in terms of population, with only 25 households in 1676, but large in terms of the number of townships it covered. One of these was Silsden, which included the hamlet of Silsden Moor. Most of the farms in this area were tenancies of Skipton Castle. We cannot be sure that Edward himself lived at Silsdem Moor, but given the small size of this family, it seems probable. THOMAZINE WILSON. The fact that Thomazine was married in Kildwick makes it likely that this was her home parish. There are many more Wilsons in Kildwick at this time than Heelises. They appear to have been settled in the parish for some time. Our first record of Edward and Thomzine is their marriage in Kildwick in 1586 This was the year before Elizabeth I executed her cousin Mary Queen of Scots and two years before Spain attempted to invade England with the Armada. Kildwick is a village 4 miles south of Skipton. It lies where the Skipton to Keighley road crosses the River Aire. “Kild” is a Norse word meaning either a spring or wide body of still water. It probably refers to the flood plain of the river Aire after heavy rain. The church of St Andrew is unusually long and was known as “the Lang Kirk in Craven”. We have baptisms for five children. None of them seem to have died in infancy, suggesting that this is a family with a reasonable income. There is another burial on 16 Mar 1610 for William Heelis. Given that Edward called his eldest son William, this may well be his father. The 16th century was largely taken up with the conflict between the Protestant Church of England and Roman Catholicism. As we move into the 17th century there were moves towards a more radical Protestantism. The north of England had retained a considerable sympathy with Catholicism. Kildwick was unusual in its succession of radical Protestant ministers. One of these was John Wilson, said to be an inhabitant of Kildwick, He was almost certainly related to Thomazine, though we do not know how close this relationship was. The controversy started with, Alexander Horrocks, who was was vicar of Kildwick from 1571 to 1589, when Edward and Thomazine were growing up and starting their family. He became the first married vicar of Kildwick, marrying twice. In 1587 he displeased the church authorities and was imprisoned in York Castle for 10 days, until he publicly recanted of his errors. His principal crime was allowing John Wilson to preach in his church, despite the fact that the latter was licensed to preach within three miles of it. John Wilson, who we believe to be of Thomazine’s family, was a noted radical preacher. He too was imprisoned in York Castle for preaching in Kildwick, even though this was his native place. He was probably a graduate of Cambridge, was ordained deacon and licenced by the Archbishop of York to preach in Skipton. But his preaching attracted complaints and he was summoned before the high commission on a charge of nonconformity. On his first appearance before the Archbishop and 43 commissioners he argued his case well, but was sent back to prison for another week. He was again examined and remanded, before being released after signing a bond not to preach in the province of York. The vicar, Alexander Horrocks, was further charged with not following the order of worship set out in the Book of Common Prayer. Wilson suggested that Horrocks’s “crime” was to encourage “the people of God to meet together, and to edify and comfort one another with what they have learned … to confer upon the points of religion or the doctrines taught them out of the word of God, to sing psalms, and to pray together”. The Archbishop countered that Horrocks had “gathered night-assemblies, contrary to law”. Horrocks returned to Kildwick where he ministered to parishioners including the young Heelis family, until his death in 1589. John Wilson left Yorkshire for London. He was soon in trouble with the church authorities there. Kildwick made a habit of attracting controversial clergy. When Roger Brerely was appointed curate in 1623 he already had a track record. As curate of Grindleton he preached of the power of God’s “spirit” to influence good men to a higher level of understanding including the Scriptures; he argued against the organized Church, and the sacraments; he promoted lay preaching and what he called “Spiritual baptism”. The Grindletonians believed in the overwhelming power of the Holy Spirit in their religious experience, over and above the letter of the Scripture, and in particular the Ten Commandments They believed that Christ’s atonement freed believers from the moral restraints of the law. Released from the taint of original sin, they believed they were reborn into Paradise in this life. When a high commission examined Brerely in 1617, one of the witnesses for the prosecution was J Foote, the vicar of Kildwick, but for his defence he had William Currer, probably from the influential Currer family of Kildwick Hall. A William Heelis had married Magdalene Currer in SkiptoniIn 1605. Roger Brerely was released and excused paying costs. He did not stay out of trouble. In 1627, now curate of Kildwick, he was again before the high commission. He was ordered to cease preaching except at Kildwick. 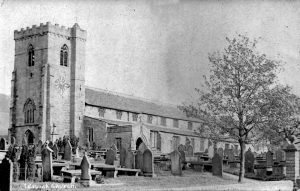 Just a week later he was ordered to give the names of those who attended his meetings and prohibited from preaching at Grindleton and elsewhere in the archbishopric other than Kildwick. These must have been lively times for the parishioners of Kildwick. Kildwick continued to have a succession of controversial clergymen in the 17th century, but by then our Heelis line had moved on. Sometime before 1608, the Heelis’s eldest son William left Kildwick and made his home in the hamlet of Draughton in Skipton parish. There was a landed Heelis in Draughton in 1543. It is possible that the Heelises had moved to Kildwick from there. We do not have the burials of Edward or Thomazine..